The Geneva and Istanbul-based World Association of Investment Promotion Agencies (WAIPA) has 170 members, but over one-third are agencies from cities or regions, not countries, such as the Agency of Innovation and Development of Andalucia or ACI Medellín. A Columbia University study estimates that around 8,000 subnational trade and/or investment promotion agencies exist. In a world of global value chains and planetary capital flows, it may sound paradoxical, and even reckless, that local governments are stretching their necks out to compete over foreign direct investments (FDI), but for every national agency, we have indeed approximately 50 at the local level promoting their economic interests internationally. A paramount reason for this unexplored phenomenon is the municipalization of global wealth. According to a recent study by the McKinsey Global Institute, 75% of global GDP is currently generated in large cities, and with current urbanization trends, cities and regions will consolidate their positions as epicentres of power and capital. Urban areas are also more prone to have a concentration of qualified human resources and better quality infrastructure, which makes these territories particularly attractive for high value-added investments. 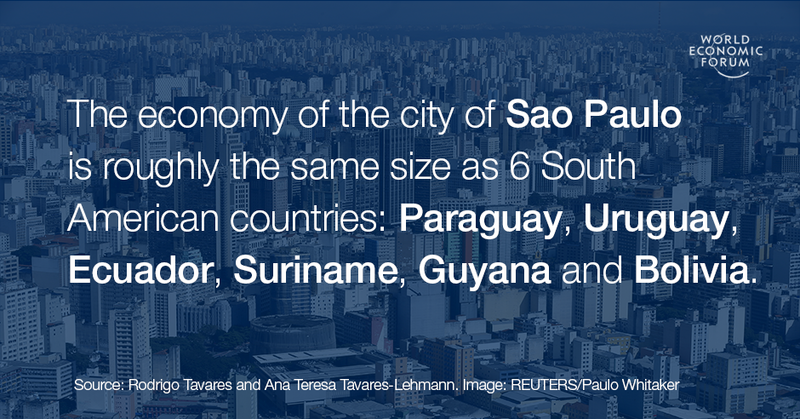 The economy of the city of Sao Paulo alone is roughly the same size of 6 South American countries bundled together: Paraguay, Uruguay, Ecuador, Suriname, Guyana, and Bolivia. Cities are more pragmatic and opportunistic. Whereas national FDI-attraction agencies often convey colourful messages punctuated by superlative adjectives, subnational agencies tend to act in a more targeted way and focus their strategies on specific projects and investment deals. They tend to have more focused mandates for investment and trade promotion, which helps them become leading experts in their territories and on activities that best match local resources and capabilities, providing detailed information to persuade the investor and turning leads into actual projects. Tel Aviv Global (a municipal entity) is a case in point. Its core mission is to position the city as business centre “that specializes in innovation” leading a municipal-national effort to attract international investors, entrepreneurs and start-ups. Subnational agencies also tend to be more responsive to investors’ enquiries. They are likely to perform better in investment facilitation and in aftercare activities, given their proximity with the investor and close links with local (public and private) stakeholders. Matchmaking is easier. Their operational nature represents a step away from national agencies, which are more prone to policy design and conceptual matters. The first is blue-collar whereas the latter is white-collar FDI attraction. In this line, a study by the World Bank on best FDI attraction practices highlights that often subnational (particularly city) agencies tend to be more innovative and customer-focused than their national counterparts. They are also bound to develop a finer assessment of the costs and benefits of the investment in order to, for instance, calibrate better incentive policies. They may provide extra incentives, on top of nation-wide incentive measures (e.g. waiving local taxes or licensing and business registration fees). In 2013 Washington State gave Boeing $8.7 billion in tax breaks (until 2040) as a condition for them to build the new jetliner 777X in the Seattle area. It was the largest state-tax subsidy granted to a private company in the country. A year later, the state of Nevada cut $1.3 billion in taxes for Tesla to install its Gigafactory that produces lithium-ion batteries. Finally, cities also have a good track-record in working with the private sector, as some local agencies are directly resourced and supported by local companies. At the national level, often for reasons of compliance or pride, operational costs are generally covered only by public budgets. But not at the subnational level. The Greater Houston Partnership, the organization that works tightly with the city government to represent Houston’s economic opportunities, is comprised of 1,200 companies. The California-China Office of Trade and Investment, California’s official trade office with the Asian country, is operated by the Bay Area Council, a business-sponsored organization. According to fDi magazine , in 2016/2017 the best investment locations (among cities and regions) are Singapore, London and Dublin. Rankings obey several criteria such as economic potential, human capital, cost-effectiveness, connectivity and business friendliness. These are structural factors, and investment promotion agencies have little leeway to promote or manage them. They are not responsible for training and education of human capital, for instance. But some agencies are better than others in the way they maximize the positive economic and demographic underpinnings of their cities and regions (or avert the negative ones) and have adopted creative and effective measures to attract investments. As investment in cities is first and foremost a quest for talent, mainly in the IT sector, Copenhagen Capacity, the city FDI agency, developed policies to connect companies to prospective human talent by offering materials to introduce foreign employees to the Danish work culture and management style (Talent Attraction Toolbox); organizing case-solving visits by talented international students to companies in Denmark (the Company Challenge); and promoting a vast array of matchmaking initiatives that companies can either host or participate in. It is also important to tackle potential deals in an all-embracing way. Barcelona, for instance has done a good job at marrying FDI opportunities with cutting-edge urban planning strategies and innovative use of technology. Deals are not treated in isolation from local assets and other opportunities. In addition, it promotes a close contact with investors at all stages of the investment process, with constant networking and building a strong sense of community between investors and the city. In 2016 it was selected as the European city with the best FDI strategy by fDi magazine. In large countries, subnational agencies will likely take most of the FDI attraction institutional space in the future. They are the ones that better know the microcosm that will be impacted by FDI (e.g. new factory, new airport) and the ones that will ultimately make the effort to fight for an investment. National agencies will work mostly as grand policy designers or as providers of political support for the largest-scale projects. For instance, the US Department of Commerce International Trade Administration aims at creating economic opportunities for American workers and businesses and has over 150 offices located around the world, but their priority is on trade promotion and on helping US companies navigate foreign markets, rather than attracting FDI. That is mostly carried out by agencies located in US states, such as Enterprise Florida or the Massachusetts Office of International Trade and Investment. In smaller countries, streamlining and cooperation between national and subnational agencies is of fundamental importance. Boštjan Skalar, CEO of WAIPA, described subnational investment agencies as “the magnifying glass for national investment agencies” as they capture the local opportuntities that could be out of reach for national agencies. Looking at Europe and Latin America, for instance, some small countries end up dividing their labour in terms of investment size (cities and regions only seek smaller opportunities) or they work in tune – often the city provides local intelligence and logistical conditions, whereas the national agency offers tax cuts or strong political support. The recently created InvestPorto (Portugal) chose to do exactly this: it offers business intelligence and municipal incentives, and facilitates the licensing process and the set-up procedures of new investors, working closely with AICEP, the national agency. Even so, there are negative examples of preventable competition and lack of coordination between city and national agencies, and of duplication of objectives and efforts. Recently, while Barcelona and Madrid went a long way to attract “Euro Vegas”, a $30 billion planned gambling and leisure resort complex, the project was dropped when the national government in Spain refused to change regulations on smoking and to give investors the requested tax concessions. And despite the staggering growth, subnational investment agencies are not immune to criticism and some of them face significant challenges. With fewer resources, they have more difficulties in opening agencies abroad (compared to countries) and in recruiting top talent. They are also often overtaken by national agencies in administering significant incentive packages. Nevertheless, with the quick growth of paradiplomacy globally and with the municipalization of wealth, cities and regions will likely play a substantial role in attracting FDI and promoting trade in the future. Expecting national bureaucracies to be able to monopolize and tackle all opportunities is, ultimately, a bad investment.